God created a world. We built the story. Enter a world full of miracles - all created in Minecraft. Nine stories from the life of Jesus are brought together in this small graphic-novel style volume in the phenomenally popular Minecrafter Bible series. Since 2009, Minecraft has taken the gaming world by storm, and is now a massive hit with children. The Minecrafter Bible books add a new dimension to Bible story reading. Garrett Romines, and Christopher Miko; skilled in using games and toys to create fun learning environments and products for children, have re-created Bible stories with the famous virtual blocks to produce vibrant, and complex 3-D worlds filled with adventure and using astonishing imagination. The images have been captured and combined with text boxes and speech bubbles to explain the stories for 7-11 year olds. The text is light, but explains the events thoroughly for the age group, and the dialogue includes in-game humour. The Unofficial Bible for Minecrafters: Life of Jesus - Pack of 5 by Garrett Romines was published by Eden bundles in April 2017 and is our 46021st best seller. The ISBN for The Unofficial Bible for Minecrafters: Life of Jesus - Pack of 5 is EDENBUNDLE-2103. Be the first to review The Unofficial Bible for Minecrafters: Life of Jesus - Pack of 5! Got a question? No problem! 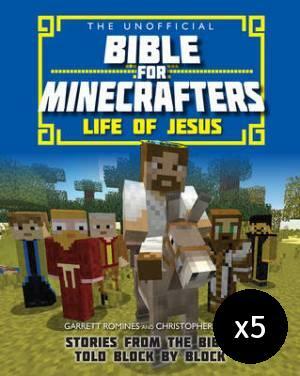 Just click here to ask us about The Unofficial Bible for Minecrafters: Life of Jesus - Pack of 5.